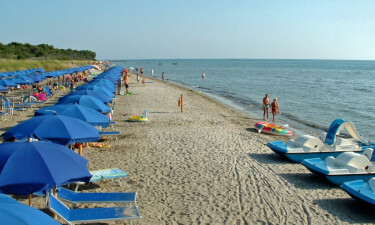 Literally translated as the ‘Bay of the Sailor’, Baia del Marinaio is a holiday camping site located on the beautiful Etruscan Coast in central Italy. The luxury camping site offers spacious, modern, mobile home accommodation and extensive facilities, including free Wi-Fi, a coin-operated laundry and a visiting doctor, and enough entertainment options to keep everyone happy, day or night. For further information on 4-star and 5-star luxury camping sites in Italy, contact the leading European camping holiday provider LUX-camp today. 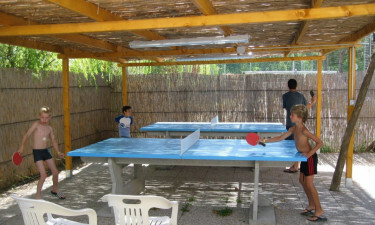 Why should I camp at Camping Baia del Marinaio? A casual, 5-minute walk from the main entrance to Baia del Marinaio, through fragrant pine forest, brings you to a beautiful, gently sloping sandy beach, with shallow water as far as 20 or 30 yards offshore. Here you and your family can swim in complete safety, or relax in a deck chair beneath a parasol, both of which are included in the price of accommodation during peak season. If you need more, deck chairs and sun loungers are available for hire. Baia del Marinaio offers 4 different levels of mobile home accommodation, suitable for up to 4 or 5 people, to suit most tastes and budgets. All the luxury camping accommodation includes fully equipped kitchen and bathroom facilities, satellite television and an outdoor terrace, or veranda, complete with a table and chairs. The higher end accommodation also includes air conditioning, French windows and heated towel rail in the bathroom. All the mobile homes are deep cleaned between guests, so your accommodation, like the rest of the site, should be spotless. Of course, a camping holiday need not be all about camping and Baia del Marinaio is perfectly positioned for full day or shorter excursions. 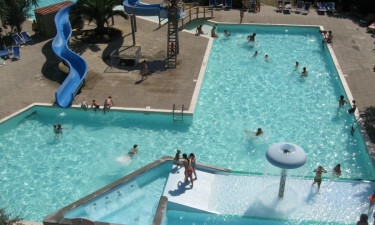 Younger visitors are sure to enjoy the Il Cavallino Matto amusement park, Cecina Mare water park or Il Giardino Sospeso adventure park, all of which are nearby. Adults, on the other hand, may like to head south on the Strada del Vino Costa degli Etruschi, the birthplace of Sassicaia, one of the most prestigious wines in the world. Luxury camping should include luxury eating and drinking, so Baia del Marinaio offers 2 bars and restaurants, known as Mauro’s and Il Pattino D’Oro, which serve delicious food and drink at reasonable prices. Takeaway options are also available. For everyday grocery shopping, Baia del Marinaio offers a supermarket, a bazaar and a newsagent that stocks foreign newspapers and magazines. Further afield, several designer outlets, such as the Mall, the Barberino Designer Outlet and the Val di Chiana Outlet Village offer all the major brands at greatly discounted prices.